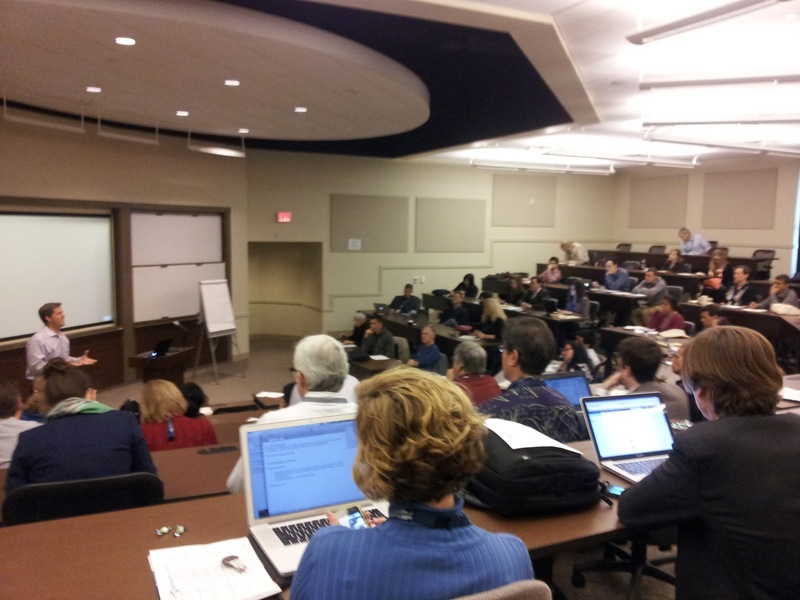 ProductCamp Austin 10 – Another successful event! Reposted with permission from Mike Boudreaux. The original post can be found here on Mike’s Leader Thoughtship blog. ProductCamp Austin 10 was held on Saturday February 16, 2013. I’m a little biased as the president of the organization, but I have been told by others that it was the best PCA event yet. I find it hard to disagree. There was a buzz around the event that I haven’t felt in the past, but maybe that was because I was more emotionally invested in this event than ones in the past. I am always amazed by the effort that the volunteers, participants, leaders, and sponsors put into making ProductCamp events happen. Nobody is paid to do this, so what motivates us? ProductCamp provides an excellent example of Daniel Pink’s motivators from Drive: autonomy, mastery, and purpose. Paul Teich took some nice photos of the event and shared this slideshow with me. Very nicely done! Arriving in the morning to see an army of volunteers getting things ready. Voting for sessions in an old-school ProductCamp way – with three stickers. Feeling the energy and buzz during the opening session. Presenting the list of Top 10 ProductCamp Austin moments. Seeing the LifeSize, HomeAway, and Spiceworks executive panel on What it takes to be a great product manager. Listening to advice from Thom Singer on Giving Better Presentations. Enjoying lunchtime conversation on the patio in the nice weather. Meeting people from ProductCamp SoCal and ProductCamp DC. Ordering extra snacks after lunch (long story). Presenting my session, What story are you telling about your products? Milk and cookies from Elizabeth Quintanilla. Winning the Best Session Award! Winning an iPad Mini and then giving it back. It was pretty awkward giving myself the Best Session award in the closing session. We didn’t plan for that situation, and so we didn’t really handle it too well. It is a little strange for the President to also be the winner, which is why it was even stranger when I won the drawing for an iPad Mini. I definitely couldn’t accept that one, so I gave it back. Some people asked me which one I wanted more. Hands down, it was the Best Session award. It is priceless! Pat Scherer sent me her visual notes for my session. She did a great job of capturing the key points of my talk. I think I might frame it and hang it on the wall in my office. Thanks, Pat! What were your favorite experiences at ProductCamp Austin 10? Reposted with permission from Stacy Dyer. The original post can be found here on Stacy’s blog. After so many recommendations and endorsements from my fellow product management and product marketing colleagues, I am pleased to report that ProductCamp 10 lived up to its reputation as a can’t-miss event for product management professionals. Networking, learning, and innovative ideas abounded at the AT&T Executive Education and Conference Center in Austin, Texas this past Saturday. While I knew I had already missed a few ProductCamps, I had no idea Austin was actually one of the first (following Silicon Valley) to launch an un-conference ProductCamp (2008) and that it has now spread around the globe. Comparing the perspectives of representatives from other cities with our own here in Austin was fascinating. By far, the best aspect of the conference overall was how open and friendly everyone was. Networking is a pleasure in such an accommodating atmosphere–even for introverts! Agile experience is irrelevant; executives consider it a check box. PowerPoint Karaoke – This session, while offered, was not actually voted in. That was a shame because it looks hilarious! It basically involves making up a story to go along with the random slides you are given and having been handed a deck by my old boss to present at a major user conference myself, I know how important it is to be able to think on your feet! I hope this is resurrected at an upcoming ProductParty soon. As a former theatre geek, this sounds right up my alley! Presenting “Architecting a Successful Whitepaper” – Unfortunately, my colleague with whom I had planned to offer a workshop session on Architecting a Successful Whitepaper had a family medical emergency and was not able to make it on Saturday. Talking with several attendees, I am sure the material we were planning on presenting would have been relevant and interesting. And I know it would have a lot of fun! I look forward to the next ProductCamp so we can try again! Throughout the day, I picked up useful links to resources, articles, and online tools. Here are some of my favorites, in no particular order! What story are you telling about your products? Do you have a favorite resource, moment, or funny story to share from PCATX? Reposted with permission from Thom Singer. The original post can be found here on Thom’s Some Assembly Required blog. ProductCamp Austin celebrated their tenth event in five years (they host this informative and motivational networking event twice a year: winter & summer) this week with a large sell out crowd of over 600 people. The AT&T Conference Center was again the perfect venue for this high energy event. It is a wonderful community gathering that is a true “Un-Conference“. Speakers sign up to speak, and the audience votes that morning on which topics are of the highest interest. This year they had a record number of proposed talks. Once the votes are cast the participants and speakers are given the schedule. Throughout the day sessions cover Product Development, Go To Market Strategies, Product Strategy, Product Management/Marketing Careers, and Marketing Execution. I had the honor to present a session called “Giving Better Presentations at ProductCamp (and Beyond)“. It was a fun experience as the audience seemed to resonate with some of my advice. It is more and more common for professionals to have opportunities to deliver presentations (at work or at a conference), and yet few people have had much training since their 8th Grade Book Reports. I loved the conversation with the group, as the topic clearly resonated. Maybe some of those who were in my session will submit proposals for the next ProductCamp!!! The rest of the day I was able to attend other sessions and visit with old and new friends. If you have never been to ProductCamp Austin then you should mark your calendar for July 20, 2013. Jump right in and propose a session, or come as a participant. Eithe way, be ready to “Teach, Learn and Network”. ***Rumor has it that if 60% of those in attendance in July are repeat “Campers”, then ProductCamp Austin president, Mike Boudreaux, will shave his head (that is a rumor that I am helping to start!). Gaining access to new ideas is the key to those who want to expand their horizons. Last week I spent Saturday at TEDxAustin, and this week I was at ProductCamp. With all these ideas, information, concepts, theories and motivation in my brain… I need to get to work and make things happen. Watch out 2013!!! ProductCamp Austin 10 was held on Saturday February 16, 2013 at the AT&T Conference Center. We almost broke the record of 620 registrations set by PCA5 in 2010. I was actually pretty happy that we got close but didn’t break the record, because Paul Young shaved his head when we set the record last time. Tension was pretty high as I looked in the mirror on Friday night, wondering if people would show up with clippers on Saturday morning. Our tenth event turned out to be one of the best. Over the past several years, we have considered, debated, deliberated, and discussed the objectives for our organization. Should we be the biggest, the best, the broadest, or the most focused? Should we expand our corporate connections, or should we serve the start-ups better? Should we aspire to fill the Austin Convention Center one day, or stay comfortable in our home at the AT&T Conference Center? One thing is for sure, we are consistently delivering inspiring and energizing events for product managers and product marketers. The buzz and energy level on Saturday was high all of the way through to the end of happy hour. In February 2011, our newly formed board of directors went through the process of identifying our mission, vision, and values. Much of this was established for us in the first ProductCamp Austin (PCA) event in 2008. For example, the values of the un-conference are set in our DNA and irreversible. Our values are rooted in the no-pitching, egalitarian, free, volunteer-driven, participation rich, and open culture that we have established in the events that have been organized. The Austin culture is a big contributor to our casual, open, and collaborative culture. Our first order of business was agreeing on our mission. This turned out to be a pretty easy exercise. We saw the ProductCamp Austin organization to be an established, stable, structured, professional organization with a solid foundation in place for future growth. We thought that PCA was ready to move forward to the next phase, from an event-based organization to a community driven one. Our Mission: Creating a community for product management and marketing professionals to teach, learn, and network in Austin. Our vision is also quite simple. One of the exercises that we used to create our vision was to imagine an Austin American Statesman or Austin Business Journal front page article about how PCA had helped the Austin product community to grow in some way. We discussed the growing challenge for local companies to find good product management talent. As the tech industry grows in Austin, we are going to need more people with professional product management skills and talent. Our vision is to help grow the product management profession, foster networking in our profession, and provide a means to connect hiring companies with talented people in Austin. Watch this video from the Austin Technology Council featuring Texas State Senator, Kirk Watson to better understand the challenges facing the Austin technology industry. Our initial offering has been fine tuned into a repeatable formula for organizing successful events. Formalizing the PCA organization into a 501(c)6 non-profit organization with a board of directors was a major milestone in Phase 2 of our growth. We now have a functioning board of directors with a focus on leadership and succession planning to ensure that we can endure the changes in people that will happen through the years to come. We also discuss areas for innovation to keep things fresh and creative for everyone who is volunteering and participating to keep things interesting for everyone involved. Phase 3 for the growth of ProductCamp Austin is an evolution from an event-based to a community-driven organization. We aren’t looking to grow our event-based participation beyond the current levels. Rather than growing our event attendance, we want to grow our community. This includes a connection with community members between PCA events. Our vision here isn’t complete. It has taken us quite a while to figure out exactly what it means to have a community, and how to measure such a thing once it exists. Our first attempt at measurement was to ask people if they considered themselves to be part of our community when they register for events. It turned out that self-identification as a community member is very high. This measurement has helped us to get through some of our circular conversations about whether we actually have a community or not. Looking at the community curve, we see a trend of increasing repeat participation from event to event. Our new-to-experienced ratio seems to have stabilized at about 50%. This puzzles us when we meet to discuss each event and to find ways to grow going forward. Survey results and feedback after the event are consistently positive. We ask people if they will return to future events and the results here are usually quite high. Why are previous attendees not returning? How can we get these people to come back and re-connect with us? What can we do to grow our community between events? For this reason, we have added a Community Manager position to our organization and we’re looking for someone who can help us to answer these questions an provide some leadership in growing the ProductCamp Austin community. This role will sit somewhere between marketing and sustainability, providing a steady drumbeat throughout the year and remaining outside of our ramp up and down behavior around the two big events we host each year. We are also adding an Alliance Manager position to help us connect our community to other organizations in Austin that might share some of our mission, vision, and values. This includes other professional organizations, local businesses who are looking to grow the product management profession, other groups in Austin, and other ProductCamp organizations around the world. Both of these positions will likely grow into team leadership roles, so we are also looking for volunteers to help out even if you aren’t able to commit to lead a new program. We are looking for a few good men and women. Any takers? Proficientz is offering 20% off for the Product Portfolio Management course in Austin, TX on April 9 – 11 for PCA Alumni. This course is ideal if your organization has been practicing product management/product marketing but your product portfolio has grown and there are too many competing agendas going in too many different directions that are diluting your organization’s core competencies. Register now!